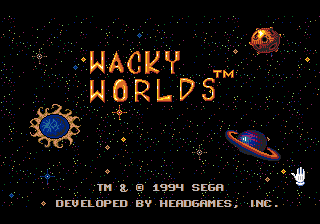 Wacky Worlds is a children's video game for the Sega Mega Drive, released in 1994. In it, the player can select (Sonic makes a cameo as the cursor) among six different Wacky Worlds in which he or she can place animated "stickers", creating a two-dimensional diorama, of sorts. Among the Worlds are an underwater scene, a scene inside a house, a jungle, and the Moon. The user is also able to alter the music played in each world by selecting from a bank of different music stickers. During development the game was known as Creative Antics. It was the first North American Mega Drive game to be distributed under Sega Club branding. The stickers are available in certain sticker books assigned for the Wacky Worlds. Each World has its own default book, but each of the other sticker books are available for use anytime as well. The same applies for the music stickers, as music from other worlds can be chosen to be played anywhere. Many of the stickers are people or characters that can move around in each world. Their movements are preprogrammed and do not stray very far from their original placement. When a sticker is first placed, it moves very little, if at all. When clicked on, it will perform its action until clicked again, at which time it reverts to its more dormant state. The player can put as many stickers as he or she wants in any world (however, there is a limit on animated stickers, most likely to prevent lag and clutter), and infinite copies of the same are also allowable. Once a sticker is placed in the World, the player can also change the colors of the sticker, using a palette. Other available stickers consist of decorations, letters, numbers, and other text. Music stickers each have a different musical phrase in them. They are "stacked" in a player that will play them in order, looping this order indefinitely. Main article: Wacky Worlds/Magazine articles.